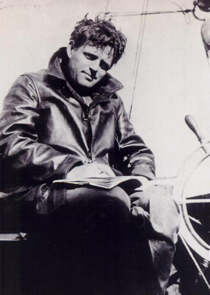 Jack London is considered one of the great writers and storytellers of the 20th Century. Who hasn’t heard of The Call Of The Wild, or White Fang, or The Sea Wolf? Did you know, however, that he wrote an amazing book on reincarnation? Did you know that his father was an astrologer, and his mother a spiritualist? Did you know that Jack London had a mystical side? I had been reading some of his books earlier this year and got confirmation to write this article after a synchronistic occurrence. I was walking down Brannan Street, on my way to 3rd, in the more nitty-gritty, raw side of San Francisco, when I did a double take. There in a tiny side street that dead-ended off of Brannan was the sign, Jack London Alley. The plaque citing his birthplace is right there. At that moment I knew I had to share what I’ve learned. Some critics pooh-poohed the book. One reviewer felt that the book’s plot was a gimmick to string stories together. Isn’t it interesting to note that critics often brush away as nonsense what they do not understand themselves? The Star Rover addresses the great themes of life, death, and the possibility of spirit existing separate from the physical body. Jack London is posing philosophical questions through his protagonist, Darrell Standing, a man condemned to death, and often tortured in a straight jacket while in solitary confinement. The various ‘tales’ are his experiences out-of-the-body with previous incarnations and time travels. There you have it. This article is meant more as a teaser than a treatise. Go to your local library and pick up a Jack London book. Buy a copy from your local bookstore. Or download the free online versions from this site. He’s wonderfully mystical. He’s timeless. See for yourself. 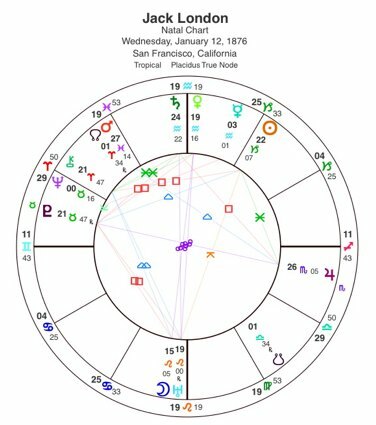 For you astrological buffs, here’s his horoscope: Note that he was born with both Neptune and Pluto in the 12th house. Both planets are necessary for mysticism to be strong in the individual. Neptune is in its own sphere and Pluto is in high profile at the apex of his very strong T-square configuration. (Some might stretch the orbs to allow for a Grand Square here with Jupiter in Scorpio.) Jupiter in the 6th balances the driving intensity of Pluto, coming from the depths of the collective unconscious. Jack London wrote about real people doing real work. This work was often done through pitting themselves against the elements. Survival of the fittest is a major theme in his life and in his writings. 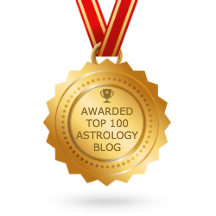 Neptune in Taurus square Mercury in the 9th shows the writing style he used to portray great and universal themes through his often raw and compelling stories. The trine aspect from Jupiter to Mars in Pisces shows the lyrical, poetic, and flowing side of his mysticism. This was truly the path whereby he gained growth as a soul: his voyages by water into the mysterious realms of both heaven and hell. Water, in astrology, is also equated with feelings and the emotional body. Thanks, Randy. Let me know if there’s any topic of further interest to you.